There’s something about Hermès and their leather bracelets that’s guaranteed to ‘spark joy’ (just make sure you organise your jewellery the #KonMari way) in anyone’s life. Some own just one and swear by it, while others have way too many to count, just because. And because seasonal colours such as Bleu Encre have been covered recently over here, today’s spotlight falls on gorgeous hues of brown and red. 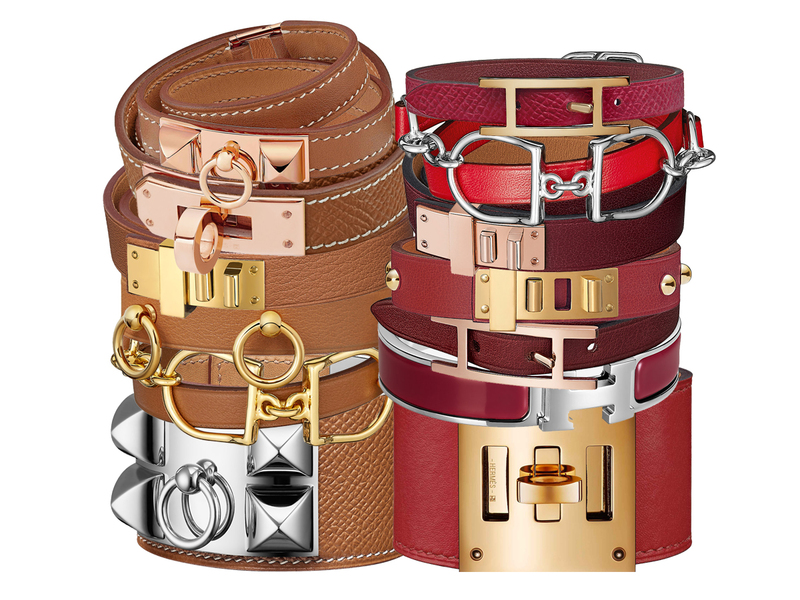 According to Hermès, red is made up of Bordeaux, Rouge Grenat and Rouge H (amongst others), while brown predominantly consists of two of Hermès’ signature hues, the classic Gold and Fauve (a colour that’s typically paired with Barenia calfskin). As for hardware on leather jewellery, there are just four, GHW (Yellow Gold), PHW (Palladium), RGHW (Rose Gold) and Permabrass. Without further ado, here are the prices for the pieces above, denoted in Singapore Dollars for your easy reference. Starting with the Behapi Simple Tour (SGD470), a reversible leather bracelet that’s adjustable to 3 different lengths and favoured by men and women alike. As for those of you who love looping your bracelets twice, the ones above include the Kelly Double Tour (SGD770) and Rivale Double Tour (SGD810), both of which are classic pieces. Looking for something relatively new in the leather bracelets lineup? The Etrier Double Tour (SGD930) would be it. Next up, chunkier favourites like the Kelly Dog (SGD890) and the Collier de Chien (SGD1700), both of which are adjustable to 3 different lengths with sizes available for both men and women. As for the Clic Clac (SGD1050), it isn’t exactly a leather bracelet (it’s predominantly enamel), but it still remains one of the top choices in the category. Rounding up the lot are pieces from the Mini Dog line which are miniaturised versions inspired by the Collier de Chien collection. The clasp in front reminds you of the hardware at the back of the bracelets. The collage above features 4 different bracelets under the line, starting with the Mini Dog Simple Tour (SGD620) and Mini Dog Double Tour (SGD710) that come without any extra hardware elements on the leather strap. Pieces furnished with extra round studs are called the Mini Dog Clous Ronds (SGD780), while the Mini Dog Anneaux (SGD820) comes without the clasp save for 3 round rings right at the front.